IST was contracted to investigate the source and origin date of an occurrence of light non-aqueous phase liquid (LNAPL) on an unnamed tributary to Manada Creek in Dauphin County Pennsylvania. The source and origin date was a point of disagreement between IST’s client, the former facility owner, and the current facility owner. IST was also tasked with designing, building, and installing a remediation system at the site. Effective remediation of the site that included more than 4 acres impacted by LNAPL (delineated by gauging of over 40 ground-water monitoring wells) demanded a rigorous understanding of the source(s) and transport mechanisms underlying the site. Thus, fracture transport analysis was necessary to design the site’s remediation system. Additionally, the fracture transport analysis was essential to physically locate the source and identify a possible source location relative to past site use. The site is located in the Valley and Ridge Physiographic Province of south-central Pennsylvania, specifically at the northwestern edge of the Great Valley. The Valley and Ridge Province in Pennsylvania is characterized by layered sedimentary rock that has been complexly folded and locally thrust faulted. As a result of repeated cycles of uplift and erosion, resistant layers of well cemented sandstone and conglomerate form elongated mountain ridges and less resistant easily eroded layers. The groundwater of the Valley and Ridge aquifers moves mostly along fractures and bedding planes in all rock types and in solution openings in the carbonate rocks. IST completed over 1,000 feet of rock coring. The primary purpose of the coring was to identify the major fractures, bedding planes, and faults that transport LNAPL. Strike and dip measurements were taken at exposed bedrock outcrops near and on the site. Then, after the coring and while the boreholes were still open, downhole geophysics were completed. 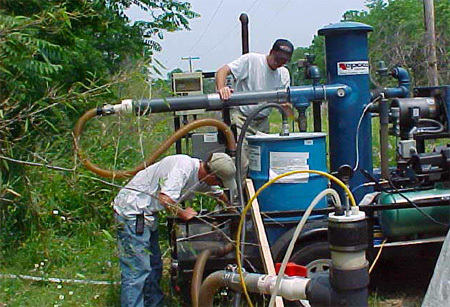 A multifunction micrologging sonde was lowered down each borehole to obtain neutron-gamma-ray (porosity), gamma-ray density, and natural gamma-ray radiation logs. In addition, acoustic televiewing and caliper logging were used for fracture analysis in each hole. The resultant logs indicated the orientation of fractures, faults, and lithologic contacts. 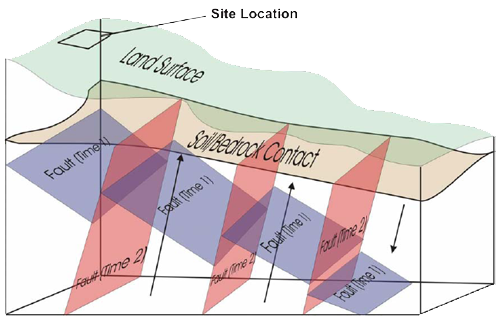 The investigatory approach took an unexpected turn during the early phases when drilling activities, which were designed to evaluate the lateral downward movement of the LNAPL, indicated that LNAPL existed in relatively deep zones when there was no appreciable LNAPL in the shallow zones. This observation led to the conclusion that vertical migration at the site was not only dependent on fractures but also on the efficient communication of vertical bedded shale bisecting the site. Furthermore, a fault, oriented from the northwest to the southeast portion of the site, though filled with fault gouge, was nonetheless a major route for the LNAPL migration. The efficacy of the different transport routes was a highly contested issue between IST’s client and the present site owner. To enhance the transport understanding and evaluate the time of travel in the subsurface system, sophisticated forensic chemistry was employed to date the LNAPL. Accepted methods of pristine-phytane ratios were employed to identify the relative weathering of the fuel. Furthermore, alkylated dibenzothiophenes and alkylated phenanthrenes and anthracenes (D2/P2) ratios were used to identify the product source. During the forensic analysis, historical sulfur concentrations of diesel fuel became an important tool to predict travel time. Since low sulfur fuel became mandatory in 1993, LNAPL samples were used to distinguish the relative date of release. It is anticipated that as the project continues through arbitration and allocation of cleanup costs, the LNAPL chemistry will be pivotal to the final decisions. After analyzing the data obtained from the fracture transport and forensic chemistry analysis, IST designed and installed three separate treatment units to provide flexible remediation of the 5 acres impacted by LNAPL at the site. Recovery wells are plumbed to trailer units with groundwater treatment and vacuum recovery equipment.